One: Essential reflexes can highjack the functioning of the whole body. These reflexes are discussed more fully in Sumner and Haines 2010. It is very hard to function effectively if we are contracting away from an irritant, stressed/ unsafe or not present. Two: Evolutionarily newer functions inhibit older functions. The social nervous system is engaged first as part a hierarchy of responses if we are threatened. The polyvagal theory of Stephen Porges (2003, 2009) develops the basic trauma model and lists a hierarchy of responses, each involving progressively older evolutionary responses of the autonomic nervous system: communication (social nervous system), mobilization (sympathetic nervous system) and freezing (parasympathetic nervous system). In humans the first responses are about communication and orientation. According to the principle of Jacksonian dissolution (see the quote above) the newer social nervous system inhibits the stress response of the sympathetic nervous system. In turn mobilisation inhibits freeze. Initially, with any perceived threat there is an communication or orienting response, an engagement with our environment to gain more information. In the orienting response, the person locates and assesses the source of the threat. There may then be a communication, for example, using negotiation or social skills to address the threat. In this stage a mouse may sense a hint of cat and sharpen its hearing and smell, open and move its eyes and turn its head to gain more information. There is a temporary stilling of the heart, breathing and posture. In humans this orienting response is highly developed and frequently includes communication. This is based on our previous experiences of attachment to figures of safety, we can sooth and reassure ourselves in contact with others. The social nervous system links together cranial nerves V, VII, IX, X and XI. They control sucking, swallowing, voice, breathing, middle ear muscles, heart rate, ingesting, facial expression and head movements. This response comes from a newer part of what was classically considered part of the parasympathetic nervous system (2). A big part of the social nervous system involves signals along the ‘new vagus’, a mylinated (therefore quicker) tract controlled by the nucleus ambiguus (3). Porges contrasts this with the old unmylienated vagus which is controlled by the dorsal motor nucleus and iniates the freeze response. Upright posture is also a relatively new function. Communication and social interaction are considered drivers for increasing brain size and complexity (Attenborough 2002). Standing upright, via our unique human upright posture, is also considered an evolutionary selective pressure on increasing brain size (4). It takes a lot of neurology to overcome gravity and balance and walk on two feet. It is relatively new neurology. Porges makes the case that the phylogenetically newer neural circuits of communication inhibit older stress response. I would argue that the same could be said of the parts of the nervous system that deal gravity and movement. When we open our heart, lift our chest, expose our more vulnerable front as we stand upright and walk freely we become more human. Three: We can ‘reboot’ the nervous system. Improving afferent input will improve the functioning of the whole nervous system. The Listening Project is ongoing research with children diagnosed with autism. It is led by Stephen Porges (Porges 2008) and uses the Polyvagal Theory as the theoretical basis. The research uses an intervention that provides acoustic stimulation to children during a free-play condition. The intervention has shown promising results in enhancing social interaction and communication behaviors. This is quite incredible research. By challenging the middle ear muscles, and improving the associated neurological control, Porges has demonstrated improvements in the ability of the whole individual. Understanding the above three principles generates treatment strategies. Any inputs that improve our ability to orient and communicate will inhibit the stress response. One of the most powerful ways of doing this is to offer stillness, space and allow the system to orient to resources and the environment in present time. The extra information from the whole body and the whole field will allow contextualisation of cycling and speedy stories and slow down the stress response. The quick response to the question ‘Am I Safe?’ is meditated by centres deep in the brain. Simply, we can talk of the limbic system and the brain stem controlling dissociation and activation. These deep brain centres receive information from three sources; from the cortex down; from the external senses in; and from the body coming up. The figure above attempts to show this flow of information (5). If we are overwhelmed, wherever the information comes from, the amygdala will trigger communication, mobilisation or freezing (Porges 2003). Orienting to the flow of information from the inside of body (interoception) and awareness of the body in space (exteroception) are much more powerful ways of inhibiting the cascade of the stress response than using the cortex down route. It is very hard to think your way out of anxiety, it is much easier to orient and feel your way out. Biodynamic cranial work can use these pathways from the body and the environment to help the system come into present time. Porges describes the vagal system as a feedback system consisting of motor pathways to change visceral state, sensory pathways to monitor visceral state and brain structures to evaluate the sensory input and to regulate the motor output. The vagus nerve especially acts to inhibit the sympathetic nervous system. The sympathetics are set to run in overdrive all the time, health depends on an active vagal brake. Thayer and Lane (2000) show that ANS imbalance (causing anxiety, poor attention and immune disorders as shown by proinflammatory cytokines plus other conditions) is due to low vagal tone. The vagal brake not working causes the sympathetics to be dis-inhibited and the system to become much less flexible in its responses. The interoceptive signals from the organs and internal environment, especially the heart and gut, utilising the heart brain and belly brain, are very powerful tools in inhibiting the sympathetics. They are also essential to our sense of self and our experience of emotion and pain (Craig 2003). Switch on the extensor muscles. In overwhelm the sympathetics and flexor muscles are switched on and the extensor muscles are inhibited (6). The flexor muscles are the muscles that we would use, all over our body, to grab hold of a telegraph pole. The extensors allow us to come into a softer, upright, open and receptive posture. Supporting this posture and the reflexes to maintain it can be a useful tool in clinic work. Often in clinic work asking people to feel the back of their body on the table can help engage the extensors. Any movement information (especially spinal joints) provides afferent input (sensory information) to the nervous system that improves the functioning of the whole body and brain. All animals that evolved to move show strong symmetry around a midline. Supporting balance around the midline is a powerful way of stimulating the neurological control of movement. The social nervous system nerves listed by Porges are cranial nerves V (trigeminal), VII (facial), IX (glossopharangeal), X (vagus), XI (spinal accessory). The motor outputs of the social nervous system according to Porges are head turning, muscles of facial expression, muscles of mastication, middle ear muscles, larynx and pharynx, heart and bronchi. The sensory inputs to the social nervous system cranial nerves are interoception (discussed above), sound (the input that changes the tension in middle ear muscles), mucusol linings of the oral cavity, nasal cavity, and sinuses, the teeth, and the sutures, dura, skin and arteries of the cranium (Barral and Croibier 2009 p.13). For craniosacral therapists the ability to interact with the dura and sutures of the skull is central to the cranial paradigm. If Porges can switch on the whole nervous system of autistic children by stimulating cranial nerve control of the middle ear muscles, it is hard not to be excited about the possibilities in cranial work of stimulating other social nervous system cranial nerves. Particularly the trigeminal nerve via the dura and teeth and the vagus nerve via interoception. Any interventions that support the functioning of the cranial nerves (e.g. opening of the jugular foramen, opening of the sinuses, free movement of the bones of the cranial base, nerve and blood flow through the carotid sheath, orienting to the ganglions of the cranial nerves) potentially have the ability to ‘reboot’ the whole nervous system. 1 The part in double quotes is a direct quote from Jackson. The reference given is: Jackson JH. Evolution and dissolution of the nervous system. In: Taylor J, ed. Selected Writings of John Hughlings Jackson. London: Stapes Press; 1958:45–118. 2 Thanks to John Chitty for pointing out that the new vagus model and the social nervous system are not described by Porges as being part of the parasympathetic nervous system. In Cranial Intelligence I did not fully understand this and was imprecise in saying parasympathetics inhibit sympathetics – what I should have said is the social nervous system and/or the vagal brake inhibits the sympathetics. 3 Porges contrast this with the old, unmylienated vagus. Freezing relies on unmyelinated vagal efferents originating in the dorsal motor nucleus of cranial nerve X (DMNX) (Porges 2003). The DNMX projects to the heart and bronchi, drastically slowing down the heart and respiration. 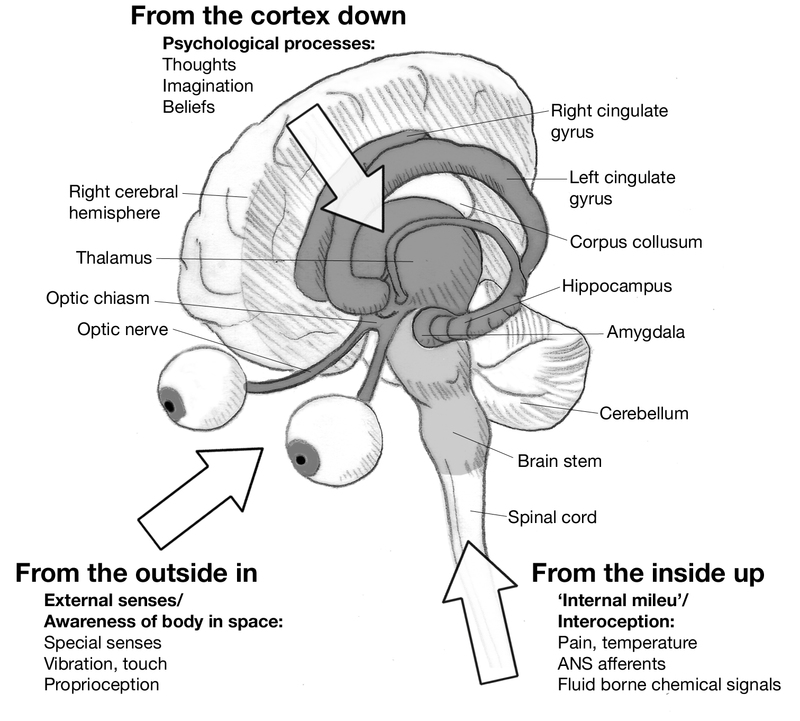 5 The labelling on this diagram has been updated from the version in Cranial Intelligence (Sumner and Haines 2010). I have since read Craig (2003) and Blakeslee and Blakeslee (2007). I like their framing of interoception versus exteroception and moved proprioception to the label outside in/ awareness of the body in space. Attenborough, D. (2002) Life of Mammals. DVD from the BBC. Barral, J.P., and Croibier, A. (2009) Manual Therapy for the Cranial Nerves. London: Churchill Livingstone, Elsevier. Blakeslee, S. and Blakeslee, M. (2007) The Body Has a Mind of Its Own. How Body Maps in Your Brain Help You Do (Almost) Everything Better. New York: Random House. Diamond, J. (2005) Guns, Germs and Steel – A Short History of Everybody for the Last 13,000 Years. London: Vintage Books. Porges, S. (2008) The Listening Project. http://www.education.umd.edu/EDHD/faculty2/Porges/tlp/ retrieved 1st Oct 2010. Porges, S. (2009) The polyvagal theory: New insights into adaptive reactions of the autonomic nervous system. Cleveland Clinic Journal of Medicine Vol 76, Supplement 2, April 2009. Sumner, G. and Haines, S. (2010) Cranial Intelligence – A Practical Guide to Biodynamic Craniosacral Therapy. London: Singing Dragon.